Manchester City teenage sensation Phil Foden has scored his first goal for City at the Etihad Stadium against Rotherham in today’s third round FA Cup clash. Just as halftime was approaching Pep Guardiola’s men decided to turn up the heat over Championship relegation candidates Rotherham. 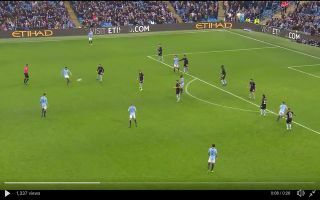 Midfielder Ilkay Gundogan played an inch-perfect pass over Rotherham’s backline and boyhood City fan Foden put the ball into the back of the net with a smart touch that deceived the goalkeeper. Foden certainly won’t forget this day, the 18-year-old starlet’s goal is his first for City at the Etihad Stadium. City look set to progress through to the next round of the FA Cup after their impressive performance so far this afternoon, the Citizens have a great chance of silverware this season, as they are also at the semi-final stages of the Carabao Cup. With the race for the Premier League title also intensifying after City’s 2-1 win over Liverpool, there is a possibility that Guardiola could come away with a double, treble or even a quadruple if they showcase their talents in Europe this season.